This month’s cover art by Patrick Jones, and cover design by Victoria Green are worthy of note. I don’t normally read Analog these days, but the name David Brin on the cover drew my attention (no disrespect to Brad R. Torgersen, Jerry Oltion, or Karl Schroeder, who also had their names on the cover). Unfortunately it’s only a short-short from Brin, just enough to give a flavour of what we’re missing from Brin – giving me a bit of nostalgia for the Uplift novels in the 80s! Karl Schroeder. Lockstep – Part III of IV. Jerry Oltion. Not for Sissies. Stephen L. Burns. The Teacher’s Gamble. David Brin. The Avalon Missions. Maggie Clark. We Who Are About to Watch You Die Salute You. You can read Louis West’s take on the issue at TangentOnline, and Lois Tilton’s take at Locus Online. 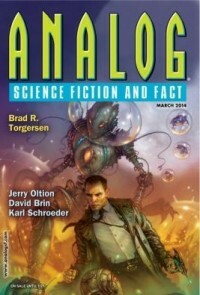 You can find other issues of Analog covered on Best SF here, with full reviews if you go back a few years!